No one signs up for a craft show with the intention of alienating the shoppers but you may unknowingly be sending them away if they don’t feel comfortable. It’s important to have fun, be yourself and show pride in your work; that will always draw people to you. Here are 5 mistakes to watch for next time you’re at an event selling your handmade goods. Once you dive into the craft scene, you quickly get to know many of the vendors, organizers and even shoppers so a craft show can easily feel like a reunion. When you spend most of your day chatting with booth neighbours, visiting with friends who have stopped by or gabbing with the organizer, it can make the atmosphere feel like a clique the shoppers aren’t a part of. Visiting is part of the fun of craft shows so we’re definitely not suggesting to cut that out; but do be aware of shoppers, even if they’re a table or two over. They’re aware of what’s going on around them and if they don’t feel welcomed or appreciated, they may keep on walking. Even if you’re in the middle of a conversation with another customer, take a second to say hi, welcome the shopper to your table and let them know you’ll be right with them or that they can interrupt you with any questions. If you look like you’re ready to pounce the second a shopper steps into your booth or you’re being too aggressive with your sales tactics in trying to pull them in, you may drive some people away. Shoppers don’t want to feel like a sales person is being too pushy or is desperate for a sale and will do anything for it. Consider how you like to be treated when you’re shopping. Most of us like to be acknowledged but not hovered over while we browse. A casual suggestion of trying one of your samples or asking if they’d like to see how your product works is perfectly fine. Giving people a stare down as they approach your table or standing in the aisle and blocking them from walking by until you finish your pitch is too much. Whether you’re shy by nature or are just trying to give shoppers their space; lack of engagement can be taken the wrong way. Shoppers, vendors and event organizers may think you’re disinterested if you keep quiet, hide behind your table or have your nose in a book all day. I know it can be intimidating to sign up for your first craft show and stand there as people peruse your work, deciding if they love it enough to buy (just because they don’t buy, doesn’t mean they don’t love it). But try your best to put on a smile and interact with the shoppers. I’m not talking about a freebie to draw customers in; I’m referencing low prices and “these aren’t selling so just take one”. If you don’t put value on your own work, how can you expect others to? I understand how frustrating a slow craft show can be but don’t use that as an opportunity to mark down prices or give items away. Shoppers will remember that next time they see you at a craft show and wonder why they would pay full price if you’re willing to give handouts when times are slower. Price it properly – set your price points to what they’re worth, not what you think people are willing to pay. Slapping low prices on your pieces in an attempt to make more sales will hurt you and other vendors in the long run. Craft Show shoppers generally understand that they’re buying one of a kind, handmade pieces and with that comes a higher price tag than they may find at the mall. If your pieces are half the price of something similar a couple booths down, they may wonder if you’ve cut corners when it came to craftsmanship or materials. Display it with pride – imagine seeing a necklace laying flat on a table with 10 more of the exact item thrown down and tangled together. Now imagine that same necklace, displayed on a crisp white bust form, sparkling under the lights, looking like the only one available. Which necklace would you perceive as having more value? Handle it with care – think includes when people are watching and when they aren’t. Nicks, snags and wear and tear will bring the value of your work down. Store your work properly at home and take the time to wrap each piece so it doesn’t get damaged during shipping or transportation. When you wrap a purchase up for a customer, put that same care in; handle the item gently, snip off price tags and wrap it in a pretty little package for them to take home. As mentioned in previous articles, shoppers typically don’t want to ask “how much?” They may not be able to grab your attention if it’s busy or they may not want to draw attention to themselves. If the prices aren’t clearly marked for each item (or group of items) a shopper may just put the item back down and walk away instead of risking a slightly awkward situation of being told the price and not purchasing. It’s not that there’s anything to be ashamed of in this situation but it can be intimidating for shoppers to have the shop owner watching their reactions. When they pick an item up and ask the price, they’re showing an interest in it. Having to set the product back down may make it seem as though they don’t want to pay that price, can’t afford to pay that price or think it’s overpriced…none of which may be true but they certainly don’t want you thinking so! 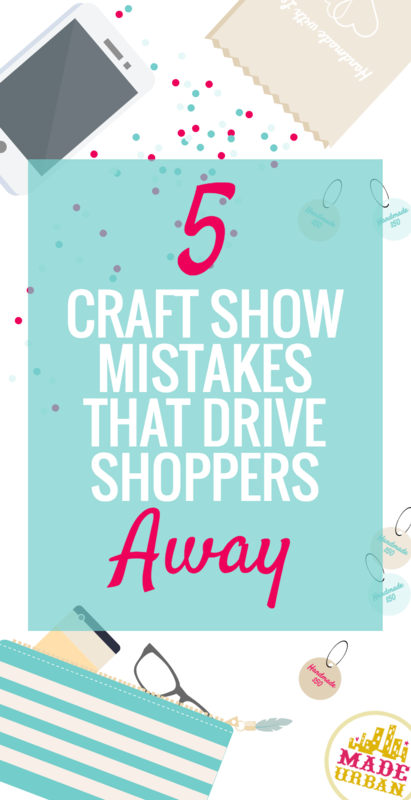 Do you have any mistakes you’ve seen at a craft show that have turned you away? Share them in the comments section. ~ Making your booth into a u-shaped one or filling the floor space up so that only 1 or 2 customers can go in and view your product at a time. People often don’t like to be in overly crowded spaces. When the Customer has no idea who the sales person is. At a busy craft show with lots of people, I think the salesperson needs to have an identifying look like an apron , a t-shirt with a logo, or even a name badge. That’s a great point Kim! Dressing the part is an important factor. Not having a variety of price points is off-putting to me. Often I like a Craftsperson’s work, but can’t afford that $400 leather tote. Having some small items at lower prices is more likely to encourage me to buy, and I might even buy multiple items. The worst thing a craft show person can do is sit on a chair and read a book. That is really rude & that person is not interested in selling his/her crafts. Is it ok to wear one of your items (scarf/shall , with a price tag on it ready to sell? That’s a good question…I would lean towards saying no. I think throwing it on when a shopper is looking at it to show them how it looks would be okay but wearing a scarf and selling it may turn some shoppers off. If you think about when you’re shopping, you want to feel like an item is brand new and special to you. That might be lost if you’re wearing the product and take it off to sell it. I know when I’m shopping in a store, I look for the one in the pile that looks like it hasn’t been tried on/opened/etc. If a shirt is half hanging off a hanger and unbuttoned, it somehow lowers the value of it. You have to use your discretion but I would say to make a demo for you to wear and not sell. How do you politely move people out of your booth, when they stand around and visit with each other? They take up space for shoppers to come in, and block your merchandise from being seen. Or they visit right at the entrance of your booth! Nobody can get past them. That’s a great question Kathy! I’ve been in that situation before and if people were standing in front of our table or booth for several minutes, blocking others from shopping, my partner or I would come out from behind the table and act as though we needed to adjust or grab something from where the people were standing. That allowed us to politely say “Can I just get you to shuffle over there for a minute so I can get in here”. It was usually enough to make them aware they were blocking an area and they’d move their conversation someplace else. For example, you could walk over to the person making rude remarks and ask “Did you have any questions about that ____________ (fill in the blank with the name of the item they were remarking on)”. As for people who simply ignore you, again, just let them know you’re around if they have any questions and try not to let their lack of a response bring you down as it likely has nothing to do with you. I just wanted to let you know, I really learned a lot of excellent tips given to the other people. Thank you! When you are doing an event that is outside and it’s hot. Is it better to set up so that people walk into your booth or walk around? If it’s hot, people may want to stand in the shade for a few minutes. Thanks for reading Shelly and Kelley! Kelley – my suggestion is typically to get shoppers to come into your booth as it creates a bit more of a commitment. Sort of like shoppers in a mall, they can window shop but once they’re in the store, it’s easier for sales people to talk to them, show options, sell, etc.